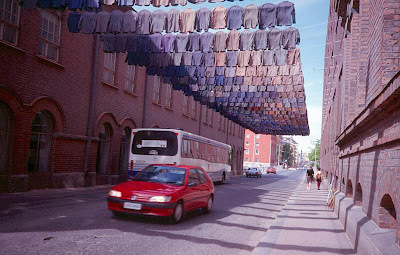 Finnish artist Kaarina Kaikkonen creates extraordinary installations and sculptures made out of recycled materials such as moulded kraft paper, and second-hand clothing. Her work with recycled clothing focuses on infusing the human spirit into environments by taking garments that seem to act as vestiges of the persons who once wore them. Old jackets, shoes and shirts take on a new life, sometimes sad, sometimes witty, but always infused with a sense of surprising vitality. 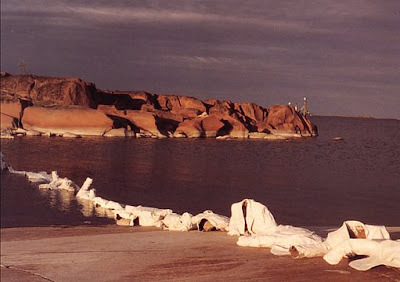 Old jackets become apparitions that seem to float above city streets, while other plaster covered jackets at the foot of a shore seem to struggle for life. 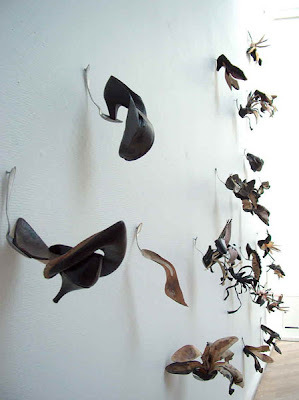 Old women's shoes turn into insect like creatures, opening delicate wings made from soles. 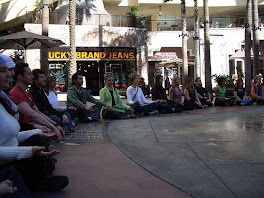 Clothing takes on as much life as the persons who wore them. 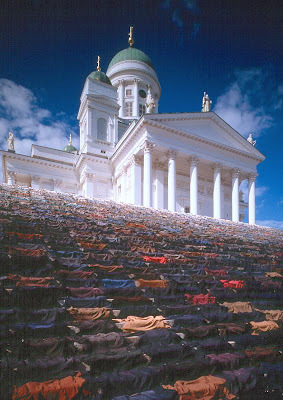 Kaikkonen' installation have been known to be quite monumental in scale, with some 3000 jackets being used towards a single installation in Helsinki Cathedral. The artists was awarded the Finnish State Art Prize and the Finland Art Award. Her exciting work revitalizes the discarded and forgotten, and brings it back to life on a monumental scale while inspiring and surprising viewers to see life in the inanimate.